Joie de vivre! I remember my mother teaching me that French word when I was about ten years old. She told me that it meant the joy of living and that I had a lot of it. I honestly couldn’t understand how anyone couldn’t have joie de vivre – I mean who isn’t happy to be alive? Looking back, I don’t believe that I was happier than any other child in my neighborhood, rather just as happy as children generally are. I think of all the older people I know at United Methodist Elder Care and I notice a certain mellowing back into that childhood happiness. Perhaps the lack of responsibilities or the adoption of an “it’s all small stuff” philosophy is responsible for this trait. When I think of this blessed quality, I think of Joy Millard. Joy is a resident at Winslow Gardens Retirement Center and turned 90 years young this past April. Honestly, she doesn’t look a day over 70 and could be an Oil of Olay model. Joy rides the exercise bicycle that is in the library outside my office every day while reading a book. I wave and she greets me with a big smile. I usually tease her by calling her “Joyful.” We’ve had our conversations about being so happy that it grates on folks around us – and then we laugh. Perhaps it’s an excess of serotonin in our brains. I asked her, “Why are you so happy? 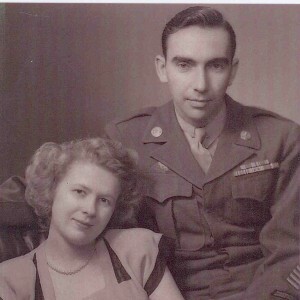 Were you always this way?” She confided that she hadn’t been happy during World War II when her fiancé and three brothers were away on tours of duty. She lived with constant anxiety that gave her nightmares and the unrelenting stress of war resulted in her having a nasty disposition that is definitely not her normal resting state these days. All three brothers and her fiancé returned safely and she settled into a marriage that lasted 58 years and blessed them with three children, five grandchildren and even six great grandchildren. Joy credits her faith in God for her happy disposition, having been born into a strong Baptist family and later finding a spiritual home within the Congregational Church. She reports having a heart to heart with God every day and tells me that the habit of thanking Him for her blessings makes her happy just to be alive. I ask her, “Do you think if your fiancé and brothers hadn’t come back you wouldn’t have had such a strong faith and such a cheerful disposition now?” A serious expression shadows her usually smiling face, “Maybe not…”, she sweetly and honestly answers me, then snaps back, “But for now I’m just a sunbeam for the Lord!” And she sure does shine!